Action Item 1: Ensure that local law enforcement agencies use evidence-based policing strategies to combat violent crime. Decades ago, law enforcement agencies took a reactive approach to public safety in which police officers responded to crimes that had already occurred. A host of research concludes that these reactive policing strategies are not effective in reducing crime. In fact, these strategies can have a “backfire” effect and increase unwanted behaviors. While responding to calls for service is an important responsibility, many law enforcement agencies have moved away from strictly reactive strategies and instead focus on preventing and reducing crime, especially violent crime. Research shows that strategies that are focused on and tailored to specific types of crimes, the people who are committing crime, and the places where crime is occurring can have a significant deterrent effect and help to reduce violent crime. 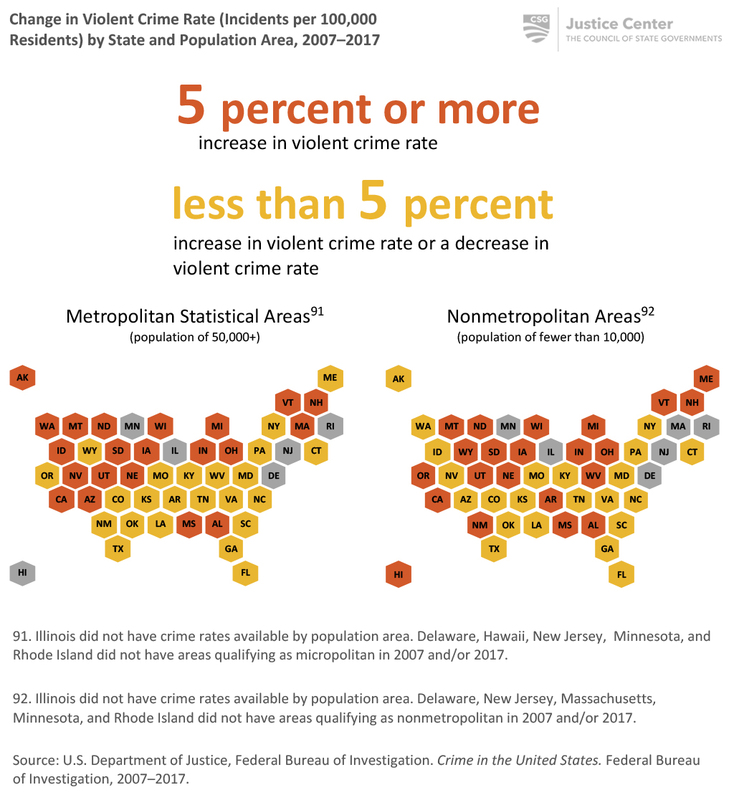 Between 2006 and 2016, two-thirds of states experienced an increase in at least one category of violent crime, with rural communities experiencing the most significant increases compared to urban areas. In light of these increases, it is imperative that law enforcement agencies use the best tools at their disposal to help reverse these trends and keep their communities safe. Unfortunately, not every law enforcement agency has the resources or knowledge to implement effective evidence-based policing strategies on its own. National police organizations and the federal government can provide critical assistance to these agencies to help them implement evidence-based policing strategies in their communities. State governments can also play a pivotal role in assisting law enforcement agencies in using effective policing practices and combating violent crime. Provide local law enforcement agencies with performance incentives to reduce violent crime. Encourage law enforcement agencies to review policing tactics currently used in their departments against the most recent research on effective policing practices. Incentivize data collection and analysis at the local level to measure outcomes of policing strategies. Support rural jurisdictions in identifying and implementing evidence-based policing strategies. Provide oversight to ensure that law enforcement agencies are not using policing strategies that are known to be detrimental to public safety. Incentivize evaluation of the impact of local policing strategies in reducing crime. What can your state do to encourage use of evidence-based policing strategies to reduce violent crime? How can your state encourage local law enforcement agencies to regularly review current research and update departmental policing strategies? How can your state support small or rural jurisdictions in advancing evidence-based policing strategies? Research on the efficacy of policing practices has identified a range of effective and ineffective strategies for reducing violent crime. Hot-spot policing evolved from evidence that crime is not evenly distributed throughout neighborhoods, but rather occurs in consistent clusters in small areas. Hot-spot policing refers to any policing strategy that focuses on deterring crime in localized high-crime areas. For evidence on the efficacy of hot-spot policing and additional resources for developing a hot-spot policing strategy, visit the Center for Evidence-Based Crime Policy. Problem-oriented policing (POP), also called problem-solving policing, is an analytical methodology that uses a variety of data points to identify underlying problems that cause crime in communities and a variety of problem-solving strategies to address those issues. POP often involves police-led neighborhood efforts to make crime hot spots less suitable places for criminal activity to occur (sometimes referred to as problem-solving projects), along with assessments of the effectiveness of solutions after implementation. For evidence on the efficacy of POP and additional resources on developing a POP strategy, visit the Center for Evidence-Based Crime Policy. Rural areas have seen more significant increases in violent crime rates than metropolitan areas. Rural law enforcement jurisdictions are less likely than their urban counterparts to have the resources to employ strategies such as problem-oriented policing to counter increases in violent crime. Crime Analysis for Chief Executives—A two-day workshop that seeks to assist top commanders in identifying how to support actionable analysis within their own departments and use that analysis to drive operations to address specific challenges such as violent crime. Foundations of Intelligence Analysis (FIAT)—Training for law enforcement that addresses the critical need for well-trained intelligence analysts to interpret growing amounts of information available today and use that information to effectively reduce violent crime. Tact, Tactics, and Trust (T3™)—Evidence-based police training system that integrates social interaction, officer safety, and community policing skills into a single, holistic crime-reduction program. Crime Analysis on Demand (CAoD)—Training and technical assistance to enhance justice agency capabilities to analyze and use data to make informed decisions, respond effectively, and prevent crime. Crime Prevention Through Environmental Design (CPTED)—Training and resources to implement strategies to help communities assess their needs as they relate to environmental conditions that may be leading to incidents and putting citizens at risk. The following list is a selection of initiatives and organizations compiled by BJA to assist states in reducing violent crime in their communities. National Forum on Youth Violence Prevention—Presidential initiative to establish a national forum for conversation about youth and gang violence issues. National Gang Center—Programming that aims to reduce gang-related crime and violence through national leadership; provision of information for policymakers and researchers; and delivery of research, training, and technical assistance to practitioners nationwide. Project Safe Neighborhoods (PSN)—A nationwide initiative to reduce gun and gang crime in the United States. Regional Information Sharing Systems (RISS)—Program to promote regional information-sharing among justice agencies to support the investigation and prevention of criminal activity. Sexual Assault Kit Initiative (SAKI)—Funding through a competitive grant program to support multidisciplinary community response teams engaged in the comprehensive reform of jurisdictions’ approaches to sexual assault cases resulting from evidence found in previously unsubmitted sexual assault kits. Strategies for Policing Innovation—Consortium of nationwide law enforcement agencies testing new and innovative solutions to address serious crime issues. National Public Safety Partnership (PSP)—Department of Justice (DOJ)-wide program that enables cities to consult with and receive coordinated training and technical assistance and an array of resources from DOJ to enhance local violence-reduction strategies. “Evidence-Based Policing Matrix,” Center for Evidence-Based Crime Policy, George Mason University, http://cebcp.org/evidence-based-policing/the-matrix/. Oregon founded the Center for Policing Excellence (CPE) within the Department of Public Safety Standards and Training in 2013 to improve the effectiveness of policing in jurisdictions across the state. CPE develops and delivers trainings and provides resources that promote the use of evidence-based practices and build trust in communities. CPE also provides the law enforcement workforce with the most current research about what works to improve public safety. In 2017, the center hosted its third Problem-Oriented Policing Conference to help departments better understand how to use data, research, and community involvement to proactively reduce crime and improve public safety. The conference brought together law enforcement officers from across the state to learn lessons and best practices from national POP leaders and local jurisdictions that have implemented effective POP programs. The state legislature allocated $959,000 for CPE in 2016 to support training and resource development to promote evidence-based policing strategies. For more information about upcoming trainings and events, visit the Center for Policing Excellence. The Washington State Institute for Public Policy (WSIPP) is a state-funded entity charged with identifying and evaluating evidence-based practices that can yield various public policy outcomes, particularly crime reduction. In 2013, WSIPP conducted an evaluation that determined that deploying one additional police officer to known crime hot spots would yield seven dollars in benefits for every one dollar of cost, resulting in $555,938 in net public benefits for every $92,597 spent on this law enforcement strategy. WSIPP uses economic modeling and analysis to determine the costs of specific, isolated strategies to taxpayers in the state and a standard financial analysis of the return on investment to Washingtonians. A portion of benefits included in the model relate to crime reduction, but also reflect labor market and health care benefits due to increased probability of high school graduation. This cost-benefit information was provided to the legislature to help inform policy and budget decisions. For the full WSIPP analysis, see Prison, Police, and Programs: Evidence-Based Options that Reduce Crime and Save Money.